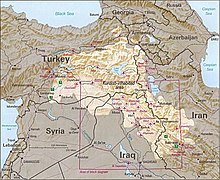 ^ West Kurdistan divided into three cantons. ANF. 6 January 2014 [6 January 2014]. ^ 2014年11月中估計，包括難民。"Rojava’s population has nearly doubled to about 4.6 million. The newcomers are Sunni and Shia Syrian Arabs who have fled the scorched wasteland that Assad has made of his country. They are also Orthodox Assyrian Christians, Chaldean Catholics, and others, from out of the jihadist dystopia that has taken up so much of the space where Assad’s police state used to be." In Iraq and Syria, it's too little, too late. Ottawa Citizen. 14 November 2014. ^ The Constitution of the Rojava Cantons. [14 May 2015]. ^ Fight For Kobane May Have Created A New Alliance In Syria: Kurds And The Assad Regime. International Business Times. 8 October 2014 [18 February 2015]. ^ Kurds regain 15km of Kobane countryside, killing dozens of IS militants. [7 August 2015]. （原始内容存档于2015年7月20日）. 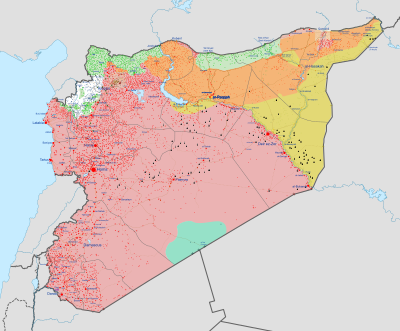 ^ Syria civil war: Kurds declare federal region in north. Aljazeera. 17 March 2016 （英语）. ^ Bradley, Matt; Albayrak, Ayla; Ballout, Dana. Kurds Declare ‘Federal Region’ in Syria, Says Official. Wall Street Journal. [2016-03-18]. ISSN 0099-9660. ^ A Small Key Can Open A Large Door. Combustion Books. [23 May 2015]. ^ 13.0 13.1 Kreyenbroek, P.G. ; Sperl, S. The Kurds: A Contemporary Overview. Routledge. 1992: 114. ISBN 0415072654. ^ Tejel, Jordi. Syria's Kurds: history, politics and society 1. publ. London: Routledge. 2008: 9. ISBN 0415424402. ^ Winter, Stefan. Les Kurdes de Syrie dans les archives ottomanes (XVIIIe siècle). Études Kurdes. 2009, 10: 125–156. ^ Salibi, Kamal S. A House of Many Mansions: The History of Lebanon Reconsidered. University of California Press. 1990: 154. ISBN 9780520071964. ^ Carsten Niebuhr. Reisebeschreibung nach Arabien und andern umliegenden Ländern. (Mit Kupferstichen u. Karten.) - Kopenhagen, Möller 1774-1837. 1778: 389 （德语）. ^ Stefan Sperl, Philip G. Kreyenbroek. The Kurds a Contemporary Overview.. London: Routledge. 1992: 145–146. ISBN 0-203-99341-1. ^ David McDowall. A Modern History of the Kurds: Third Edition. 2004: 137. ^ 21.0 21.1 R. S. Stafford. The Tragedy of the Assyrians. 2006: 24. ^ Ray J. Mouawad, Syria and Iraq – Repression Disappearing Christians of the Middle East. Middle East Forum. 2001 [20 March 2015]. ^ Bat Yeʼor. Islam and Dhimmitude: Where Civilizations Collide. 2002: 162. ^ McDowell, David. A modern history of the Kurds 3. revised and upd. ed., repr. London [u.a. ]: Tauris. 2005: 469. ISBN 1850434166. ^ Bat Yeʼor. Islam and Dhimmitude: Where Civilizations Collide. 2002: 159. ^ Jordi Tejel. Syria's Kurds: History, Politics and Society. 2008: 147. ^ Keith David Watenpaugh. Being Modern in the Middle East: Revolution, Nationalism, Colonialism, and the Arab Middle Class. 2014: 270. ^ Efrîn Economy Minister: Rojava Challenging Norms Of Class, Gender And Power. ^ 32.0 32.1 More Kurdish Cities Liberated As Syrian Army Withdraws from Area. Rudaw. 20 July 2012 [27 July 2012]. ^ Armed Kurds Surround Syrian Security Forces in Qamishli. Rudaw. 22 July 2012 [27 July 2012]. ^ Girke Lege Becomes Sixth Kurdish City Liberated in Syria. Rudaw. 24 July 2012 [27 July 2012]. 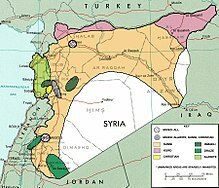 ^ Syria’s Kurds declare de-facto federal region in north. Associated Press. 17 March 2016 [20 March 2016].